I think you’ll agree that many coffee bean products seem like they might have a good flavor. If could only cook their unroasted coffee beans a little more to my liking, they would be awesome. Well, you CAN! And, we’ll show you just which beans are the Best Unroasted Coffee Beans to use. In this article, we will share our research into unroasted coffee beans. And, provide you some resources for how to go about roasting them yourself. Do You Want the BEST Unroasted Coffee Beans? If you prefer to do your own roasting, our research has uncovered several unroasted coffee beans for sale that light up the reviews. Many have tried the unroasted coffee beans below and have found them to be scrumptious! So, give one (or more) of these a try and we are sure you will be pleased with the results. 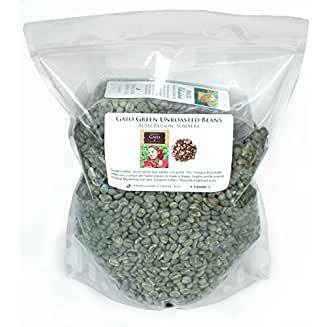 Even if you are new to roasting your own beans, these have been found to be fool proof in creating wonderful results. There are a ton of resources out there to help you roast your own. Maybe we’ll see you on one of these sites! We’ve found several unroasted varieties from Costa Rican, to Ethiopian, to Sumatra Gayo, to the very popular Kona beans. Each of these have unique flavors that have been found to be pleasing to a very high percentage of those that have tried them. Here are the top 4 unroasted coffee beans that we found during our research. Heirloom Coffee LLC is a family run coffee company that is headquartered out of Medford Massachusetts. They provide several exotic types of coffee beans including roasted and unroasted coffee beans. This Costa Rican bean offered by Heirloom has received positive reviews from the self roasting community. This bean is described as having delicious “brown sugar” notes. Costa Rica Dota Estate, Green Unroasted Coffee Beans are a little darker in color and have a strong aroma. While only a few have taken the time to post a review, all of the reviews have been very positive. The only review that was less than 4 out of 5 stars said this coffee “put them in their Happy Place”. A newbie to roasting said “I’m relatively new to roasting, but it’s virtually impossible to have any roast from these beans that isn’t phenomenal“. We feel you can’t go wrong with this coffee bean. Blue Horse Kona Coffee grows these farm-direct green beans on the “big island” of Hawaii. These beans are state inspected and certified. They are hand picked, rain water fermented, and sundried from the Kona west side of the island. 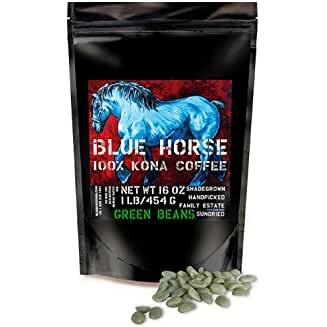 Blue Horse 100% Kona Coffee , Green Unroasted Coffee Beans grow from Blue Horse’s finest 120 year old trees. Several reviewers talk about the high quality of these beans. They say this because the beans seem to roast very evenly. This means that they all seem to have first crack around the same time. Many of the reviewers also talks about how this is a mild flavor of coffee. So, if you are looking for a strong flavor, this might not be the coffee been for you. Several roasters also talk about how this coffee bean shouldn’t be roaster more than “city+“. So, if you’re looking for something you can roast to a second crack, you might be disappointed as this coffee bean seems to do better with a lighter roast. We’ve already listed another Heirloom Coffee LLC coffee bean above. They do a fantastic job at picking beans that do well for home roasting. What’s special about these beans? Heirloom provides this exotic coffee bean from a region from which it is difficult to import. It means that these beans will have a unique flavor you won’t find anywhere else. All of the purchasers that wrote reviews gave positive feedback. The common feedback was that Sumatra Gayo Unroasted Green Coffee Beans tasted best when roasted medium to dark. The responses in the reviews was unanimous that this was a coffee bean they would recommend and would purchase again. Roasters of these beans report that the flavor is unique and when served to friends always receives a “Wow!” response. 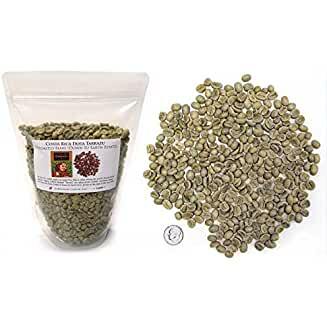 These Sumatra Gayo Unroasted Green Coffee Beans provide a special flavor that is worth a try. Don’t be fooled by the company name Fresh Roasted Coffee LLC, these are indeed unroasted coffee beans. 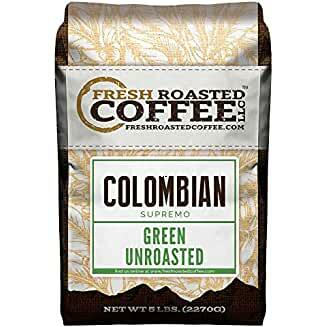 Colombian Supremo Unroasted Green Coffee is described as “delighted with the flavor“. Colombian coffee is grown in a region that is know for Arabica beans. Even though the beans are “very moist”, there were no real problems for roasters wanting to roast these beans themselves. One reviewer even roasts their coffee beans in a popcorn popper machine. This is a methodology that many roasters have found to be easy to use and easy cleanup. With popcorn kernels being a similar size and density, this does make sense. For that reviewer, the popcorn machine worked out very well. All of these unroasted coffee beans provide a unique experience to the adventurous home roaster. Even though each of these have drastically different tastes, home roasters found them all to be pleasing. Give all of these unroasted coffee beans a try. You will NOT be sorry. Blue Horse is wonderful! Kona produces some of the best coffee known to man! Thank you for sharing this awesome information! I went to your site and it looks great! I’m a huge popcorn fan, so I found your info very informative and useful.